Teacher Pear is taking you to a seafood restuarant in Hua Hin. She shows you different types of seafood. What would like to order? I would like to have seafood. There is Sand and Surf. There are prawns, scallops and fish. I would like to take one please. And I would like to have 12 oysters please. Would you like them grilled or fresh? Certainly. Please wait for a moment. It is understandable to say คุณแนะนำอะไร /kun náe-nam à-rai/ , but if you would like to sound like a Thai we use the phrase “มีอะไรแนะนำ /mii à-rai náe-nam/”. It is also common to ask อะไรอร่อยบ้าง /à-rai à-rpi bâang?/ which is literally translated as What is delicious? Using Classifier: When Pear orders 12 oysters and one plate of Sand and Surf, did you notice that there were classifier in those sentences? 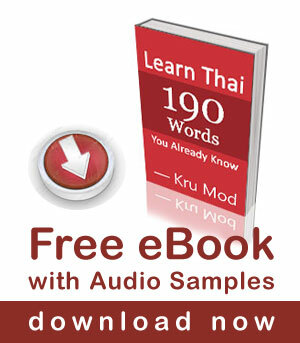 Watch this video lesson to learn more about Thai Classifiers. I enjoy all off your lessons. And listen them often. Keep up the great work! Thank you for your kind comment Neill. Very interesting and useful video lesson!